UP is the most populous state of India with 403 assembly seats. Next assembly elections in UP will be held in 3 to 4 months. 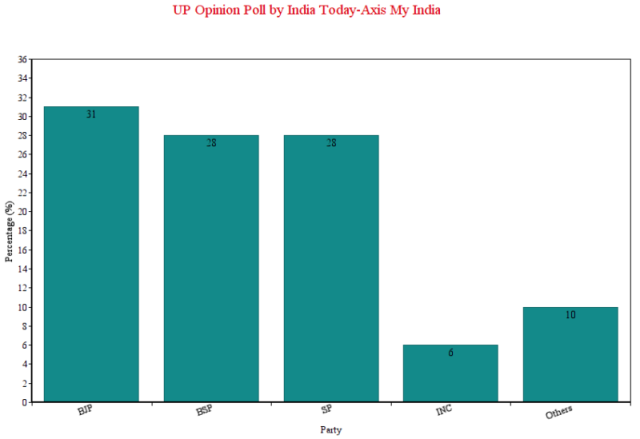 As per India Today-Axis My India opinion poll, Bhartiya Janta Party will be the biggest party in upcoming Uttar Pradesh Assembly elections 2017. BJP is likely to win 170-183 seats with 31% vote share. As per predictions, Bahujan Samaj Party might be the second biggest party with 15 to 124 seats and their vote share will be 28 percent. Samajwadi Party will able to win 94 to 103 seats with 25 % vote share. Some bad news for the Congress, they will manage to win 8 to 12 seats with only 6% voter Share. Regional parties and Independent candidates will win 2 to 6 seats with 10% vote share. As per the survey aired and published on Aaj Tak new channel, Mayawati is most preferred Chief Minister Candidate with 31% vote share and Akhilesh Singh Yadav (27%) is second most favorite CM candidate after BSP supreme Mayawati. Other preferred CM candidates are Rajnath Singh (18%), Yogi Adityanath (14%), Priyanka Gandhi (2%), Sheila Dixit (1%) and Mulayam Singh Yadav (1%). As per the UP opinion poll survey predictions, 58% Muslim voters will cast their vote in the favour of Samajwadi Party and 21% voters go with Bahujan Samaj Party (BSP). Indian National Congress and Bhartiya Janta Party will get 5% and 4% vote share respectively. 90% respondents said that Surgical Strike in PoK by Indian Army is a very good move.